Activities - Wingspan Life Resources Wingspan Life Resources | Empowering Abilities. Nurturing Spirits. Caring for Life. 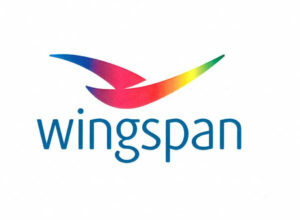 At Wingspan Life Resources, we believe that life is to be lived to its fullest. That means creating opportunities that ignite our residents’ potential and encourage them to thrive. The following activities are just some of the ways we promote our residents growth. Development Officer Darolyn Gray facilitates our Glee Club. In 2013, Wingspan began a collaboration with MacPhail Center for Music’s group music therapy department. Since then, over 70 clients and staff have had a chance to participate in Glee Club. The group rehearses on Monday nights at 6:30 at our Plato campus. Though our partnership with MacPhail ended in 2018 due to their lack of staffing, we hired a new Music Director, Sean Turner, former Music Department head for McNally Smith College of Music. 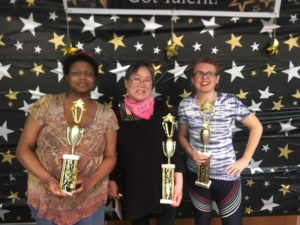 Glee Club has performed at our gala and at public concerts with such well known artists at rock star Kat Perkins, jazz vocalist Patty Peterson, gospel virtuoso Robert Robinson, folk-violinist Gaelyn Lea Tressler, Rachael Kroog from Showstoppers, and bluegrass band The Lowland Lakers. Glee Club is about so much more than singing. 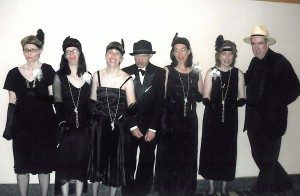 The group supports one another with praise and encouragement, and many wonderful friendships have formed. Quiet leaders have emerged and we notice a tremendous boost in self-esteem. 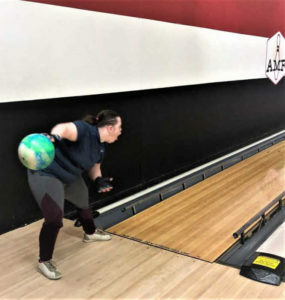 From February thru April each year, every other Wednesday night at 6PM, we offer bowling at a discounted price at AMF Saxon Lanes in Little Canada. 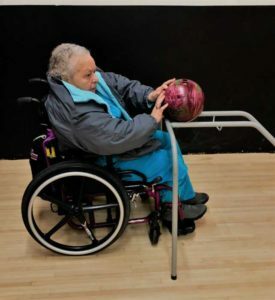 Program Director Shelda Thompson coordinates the activity, and all are welcome even if they choose not to bowl. It is a great opportunity to have a meal together. get some exercise, and to celebrate our core value of fellowship. We appreciate that the bowling alley offers us a special price of $4.00 for two games, including shoes, and staff can participate at no charge. Reach Shelda at sthompson@wingspanlife.org for more information. 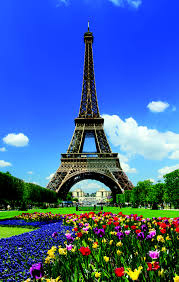 Food, Fun, and France–French Club on Thursday nights starting in March of 2019 for 9 weeks we will collaborate with teachers from Alliance Francaise of Minneapolis St. Paul (www. afmsp.org)—a teaching organization that promotes French language and culture. Alliance Francaise is the largest cultural network in the world. Clients will learn about culture, customs, holidays, learn a few French greetings, learn a song in French, and we’ll set up a French market and pastry shop one night to learn about food. A French Chef will help us prepare a meal to enjoy on another night! Program Director Julie Leiferman and other staff coordinate our annual “Wingspan’s Got Talent”show. Clients, as individuals or in groups, dazzle the audience with many different talents—there may be singing, zumba dancing, martial arts displays, poetry reading, rap performance, joke telling and more. Judges always have a very difficult time choosing the top three performances, and all participants receive an award for their efforts. In the Spring of 2019, a new initiative called “Rock the Mic” was formed to encourage self expression through spoken word an poetry. They therapeutic benefits of writing are well documented. What an excellent way for clients to explore feelings. The first group will meet Tuesday nights at our Plato campus and work with “Desdamona”– is an international award-winning artist; who has taken her distinct lyrics, sounds, and artistic stylings to audiences from Minnesota to Hawaii to Puerto Rico to Germany; gracing some of Hip Hop and poetry’s most illustrious stages. She has won five Minnesota Music Awards for ‘Best Spoken Word Artist’ in the years 2000, 2003, 2004, 2005, and 2006 For that reason, and her strong standing in the male-dominated hip-hop scene, she is considered to be the best female spoken word and hip-hop artist in the Midwest. There will be a performance opportunity for those who want to present and we will also produce a booklet of the work created. 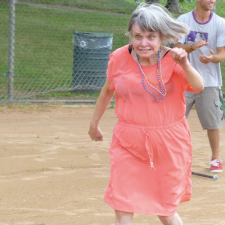 House Coordinator Sharron Aken of Harmony House coordinates our summer softball league which takes place on Sunday afternoons at Sibley Park in Minneapolis. Clients and staff of all abilities gather for fun, cheered on by enthusiastic fans. What a great opportunity to participate in a sport. In-Home Supervisor Karen Nelson and Assistant Supervisor Carol Hanson coordinate this fun day of activity held 10 times per year on Saturday at our Plato campus. It is open to Wingspan residential clients as well. The activity includes lunch, a craft project, and games from 11am to 2pm. Not only is it a good time to meet with other women to build friendships (some very long lasting), but it is also a place to give and receive support. We see a boost in confidence, self-esteem and happiness in all of the ladies who attend–in part because of their beautiful and inclusive spirits, but also thanks to the friendly, caring staff who create a positive and fun atmosphere of equality. 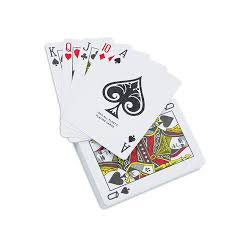 This activity of our In-Home program meets on Tuesday afternoons from 4:30pm – 7pm at Sherburne House. Ladies gather for fun and games of Yahtzee, Uno or other favorites. They may also enjoy pizza for dinner. In-Home Supervisor Karen Nelson started this activity in 2008. 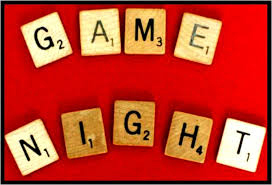 It takes place most Friday nights, weather permitting, from This is a time for men to get together for sporting events, plays, shoot pool, bowl, movie, community activity, dances, festivals, Bingo, Karaoke or live music and other activities, have dinner and just hang out and be men together. Friendships are forged and socializing in our communities is the norm! 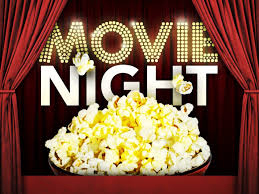 Program Director Eric Hemme coordinates movie night one Friday night per month at our Plato Office. Not only is it entertaining, but it’s a great monthly of reunion of clients and their staff. Refreshments are provided. This class has been n activity for In-Home clients for over 16 years and takes place every Wednesday at our Sherburne office from 4:30pm – 7pm. Learning to prepare dishes for oneself or family is an important life skill. It builds community and is something that everyone can enjoy and receive the benefits of. Art is also part of cooking class. 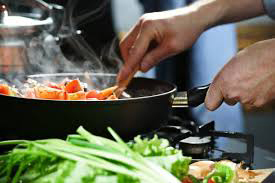 While food is cooking it is a great time to interact with each other and work on an art project or watch a movie. Friendships are forged over veal Parmesan and hotdish! House Coordinator Deb Hofbauer facilitates this special program and safe space for LGBTQ adults with disabilities. It is educational, respectful, and supportive. The group gathers on Thursday evenings once a month at our Plato campus. They also go out to dinner and attend special events in the community. It is open to non-Wingspan clients as well. 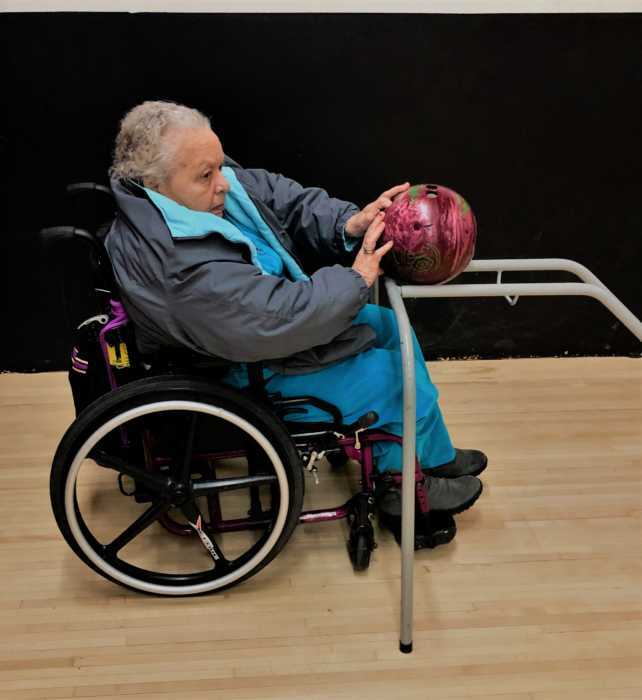 We offer an endless array of activities including creative arts, a peer support group, Bingo, chair yoga, and more. From time to time we receive discount tickets so that clients can attend performances at the Guthrie Theater. In addition, we celebrate birthdays, have a Halloween party with costume contest, and celebrate the holidays in winter complete with gifts and a visit from Santa. Sometimes “Elvis” (Eddie Hughes) comes to our parties to sing and dance with clients. 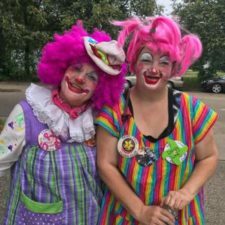 We also have a summer picnic for clients and their families that has included a fun carnival theme with food, games and prizes. An outing to the State Fair is also something clients look forward to every summer.